There are cutesy weather sites that show an animated person wearing clothes that reflect the weather forecast, weather apps that inundate you with car ads, and then there’s Wx. Created by Hunter Research and Technology, this interface won a Mac Gem award in 2009 for its performance on Mac OS X. Now the app works on the iPad, and it looks like something right off of Information Is Beautiful. 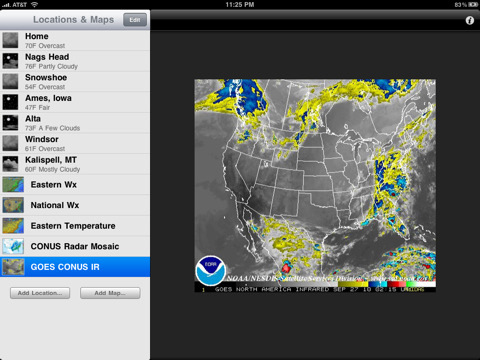 After all, Wx doesn’t work with traditional weather layouts the way most weather apps do. 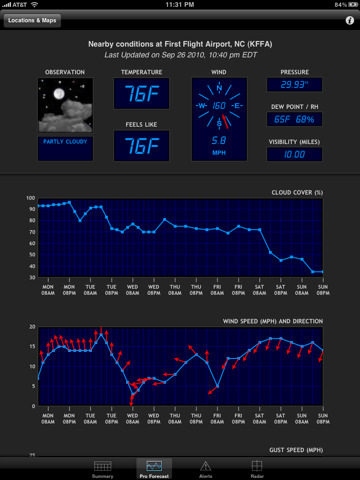 Instead it offers general information like the current temperature and seven day forecasts in a typical fashion and then delivers additional information (dew point, chance of precipitation, gust speed, feels like, etc) in geeked out graphs. The result is a weather app that’s great for geeks and even better for geeks who are also obsessed with the weather. In the beginning the app lets you use your current location (or locations) to find the nearest NWS observation site (more than 1700 choices in the U.S.), nearby NEXRAD radar sites, and alert zones closest to you. 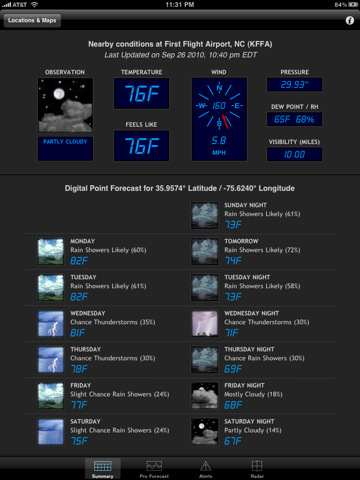 From there you get XML information feeds that show summary stats (temperature and seven day forecast), alerts, pro weather (graphs that include information like wind or relative humidity), and radar. Each of the aforementioned options exist as tabs in the lower part of the iPad screen, and the current observations rest on the top half of the screen regardless of where you click. The rest is below, and if you’re interested in hourly forecasts you’ll probably find yourself scrolling through clicking on times within the graphs in the Pro Weather section most often. That said, reading details of the weather on this app might feel like one of those binary code watches that lets you read the time through lit LEDs. The display is much cooler than any of the other watches on the market, but it takes a little getting used to when it comes to figuring out exactly where you need to go to figure everything out. Still, the app is intuitive and beautiful. 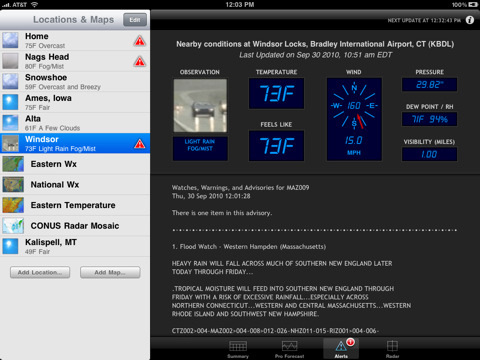 You can toggle through various locations in the left hand panel and set up any of your favorite weather maps (in addition to some preloaded weather maps) by adding their URLs. 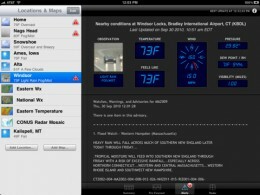 You can also choose between different blue lettering displays with the information button in the upper right hand corner, sound alarms for active weather alerts, and set up how often the app updates your weather information on WiFi or 3G. 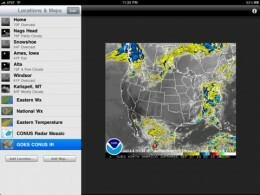 People looking for a quick and easy weather fix might not love this app because of its parsed out nature. 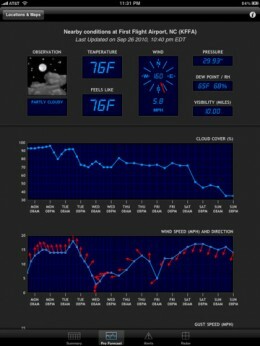 Serious weather aficionados with an affinity for graphs will love Wx though. It’s powerful, aesthetically beautiful, and certainly capable of keeping you on top of the weather. Bottom Line: Wx is a beautifully laid out weather app that makes you feel like you have your own meteorology team on demand.